This is a simple recipe for a healthy meal at home. Mahi with asparagus, quinoa, and peas. 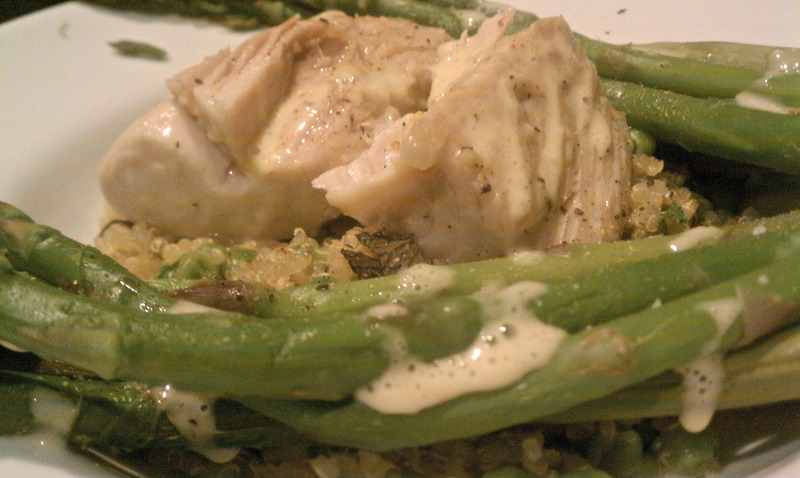 The addition of aioli pulls together the fish and asparagus to make this a restaurant worthy meal. In a saute pan, add 1 tbsp coconut oil, 1/4 cup white onions, 1 clove garlic. Cook onions until translucent in color. Then add mahi filets on medium heat. Continue cooking filets on medium heat, flipping sides occasionally until cooked all the way through. Blanch or steam asparagus in boiler. Bring 2 cups water or low sodium vegetable broth to a boil. Add 1 cup quinoa. Reduce heat to low and slightly cover pot. When quinoa is opened up and has absorbed most of the water add 1/2 cup fresh or frozen peas. Salt and pepper to taste. Combine 1 egg and 1 garlic clove in food processor. Add 1/2 teaspoon salt and 1/4 teaspoon pepper. Slowly add 1/2 cup coconut oil and then 1/3 cup olive oil in a steady stream. Pulse mixture together until it emulsifies. If it doesn’t turn into a thicker mayonnaise substance, add 1 more egg, as the first egg may not have been large enough to make the mixture thicken. 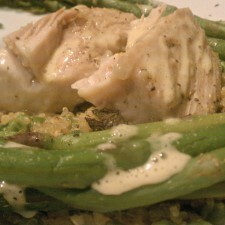 Top mahi and asparagus with the aioli sauce. Aioli may be kept for 2 days when refrigerated. I would love to try this sauteed fish with aioli. My husband loves fish and I keep looking for new recipes. This recipe sounds like it would be very good. I also love the side dish of quinoa. Try it and let us know how it goes. It was delicious!